1. “City Magick: Spells, Rituals, and Symbols for the Urban Witch” was your first book that was published. How does it feel to see it back in print? It’s honestly a little weird. Though I am very happy with the book and how it started my writing career, I feel a lot less attached to it now and it feels like a lifetime away. I no longer work in the city and have those same issues, so when folks want to talk intensely about it, I feel a little disconnected. I just moved into a lovely home with a barn and five acres in New Hampshire, and we’re setting it up to be the home of the Temple of Witchcraft. I find the woods calling to me more and more, and only in the cities when I travel to teach. 2. What had inspired you to write “City Magick”? I was working at Fort Apache, a Boston area recording studio and record label. I had just gotten my first degree in Witchcraft, and shifted from this more coven based, outdoor practice in the suburbs of New Hampshire to working all the time in Cambridge, and staying out late at shows and events in Boston. My time off was between office hours and the next show, and I was trying to squeeze a magickal practice in at that time. The techniques naturally grew out of my experiences there and some inspiriation from my partner, Steve Kenson, and his approach to magick through Chaos Magick. Some Peter Carrol, Phil Hine and Grant Morrison helped me on my way. I kept good notes on my practice, and when I found myself no longer employed, I began writing about it to fill the time and soon had a book to publish. 3. I think many Pagan magic users feel the closer to nature the better. Are there perhaps any advantages to city based magic? I think it teaches you to feel the current of life force anywhere you are. I think someone who can only practice in nature isn’t really paying attention and needs to gain better percpetion and connection. Nature is everywhere. It is tenaciously growing through the city cracks and found upon the streets no matter where they are. Cities have their own nature, their own ecosystems, their own spirit systems, and they are available to us. 4. At this point in your career you’ve traveled quite a bit, are there any cities you find particularly magical? Seattle. I love Seattle. Great harmonious mix of nature and city, art and magick. Just returned from there actually, so I might be a little biased. I find San Francisco, Boston and New York City particularly magickal. London is overwhelmingly magickal. At times I feel like I’m wading through the aura of London, but at other times, it’s easier. I wonder if that has to do with seasonal or astrological alignments. Cities have astrology and charts, just like people. They have their own persona and character and life their share with their inhabitants. 5. “City Magick” offers an extensive list of exercises for readers to try such as Sidewalking and TV Scrying. What are some of your favorites and why? The Sidewalking is still one of my favorite – to attune to the energy and currents and spirits just when out for a walk. You can do it in the woods on a trail, or in the city through downtown. It helps you pick up on what is present energetically wherever you are. I also like looking for magickal symbols in graffiti art. That is still inspiring. I used to blog about it when I traveled, but haven’t done it in a while. 6. In “City Magick” you discuss magic having three basic building blocks, “the three Rs: reality, rapture, and ritual”. Do you still use those building blocks when discussing magic now, 11 years later? I don’t think I use that same language today. I tend to focus now on the teachings of the Temple of Witchcraft, and the three there have gotten boilded down to clear intent, strength of will and a method to direct energy. There are some parallels, but not an exact match. I think for the Temple, it was more about basic spell casting magick to start, while City Magick was talking more about magickal consciousness in general. 7. 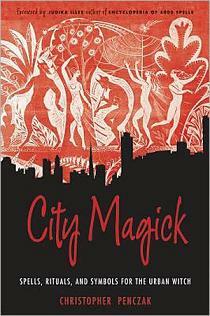 Obviously there is no shortage of books dealing with magic in nature, and “City Magick” covers cities extensively. Can readers adapt the lessons in “City Magick” for life in any of the seemingly zillions of American suburbs? I think so. In some ways, suburbs are becoming more urban now, aren’t they? The suburbs of my youth are not what they are like now. They are much more congested. So I think the basic idea of attuning the spirit of place, no matter where you are, applies anywhere and anytime. 8. You recently designed spell charms/coins for Deva Designs. Can you tell my readers a little bit about them and where they can find them? I was approached by the owners of Deva Designs to help co-create a magickal line of products that would serve the Pagan communities and beyond. Deva Designs has a stellar reputation of making magickal products at fair prices. I was always a big fan of their Ted Andrews animal coins and liked their Goddess designs. We designed fifteen spell coin pocket charms, and have release the first five – Love, Healing, Prosperity, Protection and Psychic Power. They are designed with a magickal geometry and symbolism, combining images from several different systems as used in modern Witchcraft. On the back is a spell written to activate the charm. Follow the instructions and recite the spell while holding the charm and then carry it in your pocket. I sell them on my own website, www.christopherpenczak.com, and local metaphysical retailers can obtain them through Deva Designs whole sale and provide them to the public. 9. I know you’re always insanely busy, do you have any upcoming projects you can share with my readers? Well, I’m super excited about the Temple of Witchcraft’s new land project. We have obtained a mortgage on a property where the founders of the Temple will be living and paying rent to the Temple. We don’t work on the traditional parsonage model even though we are a nonprofit church in the eyes of the federal government. The first floor of the house and the barn will be Temple facilities, and we are raising funds for a parking lot and barn renovation. Anyone who wants to donate, can visit www.templeofwitchcraft.org. We’ll be putting together a formal donation program for these projects soon, as they really just happened less than two weeks ago, but anyone can donate via our paypal donation button. I’ve also completed work on two new books to be put out through a publishing company that I’m a co-partner in, Copper Cauldron Publishing. This month’s release is The Feast of the Morrighan, a book about the Celtic Crow Goddess the Morrighan. The second will be out early 2013 is called The Mighty Dead, a book on the enlightened ancestors of the magickal traditions, and most specifically, of Witchcraft. And lastly I’m helping Laurie Cabot out with her next book, a spell book gathering her years of experiencing running a shop, teaching and pioneering her way as a Witch. It’s great to be reconnected with one of my first and beloved teachers and get such a first hand, direct teachings that we are able to share with the world. Have you tried Nettles for your allergies? They work wonders for me and my other partner, Adam. 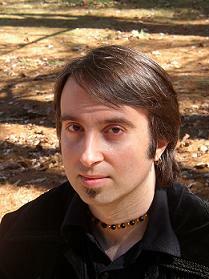 Christopher Penczak is a modern Witch, teacher, and healer. He is the author of the acclaimed “Inner Temple of Witchcraft” series and of “Gay Witchcraft”, Weiser Books, 2003. He offers classes and workshops throughout the U.S. Visit him at: www.christopherpenczak.com.